Now that the busy holidays are over, you can focus on getting your home organized for the New Year. 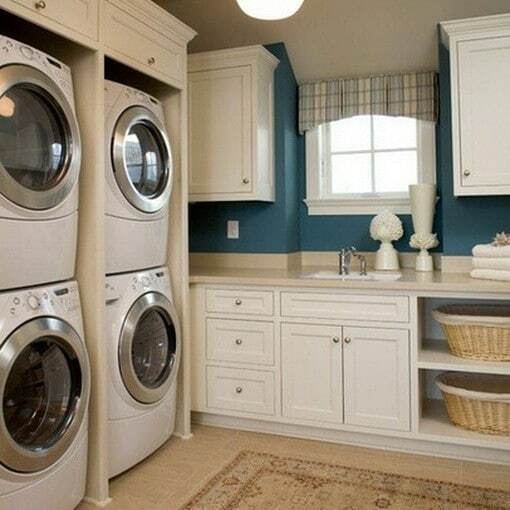 Before you do anything else, get your laundry room organized to create a more functional space. Whether you have a small or big budget, little or large space to work with, get inspired by these tips to organize the laundry room. Even when you don’t have a lot to spend, DIY laundry room organization can go a long way. Take this hanging door rack, for example. Wide, flat shelves give you room to store detergent, household cleaners, paper towels, and other laundry room necessities, freeing up counter, floor, and shelf space in the process. For an added touch, you can even paint the inside of the laundry room door with black chalkboard paint. Then you can make interchangeable labels for each rack or leave messages to your family members. Get inspired by My Sweet Savannah. Another idea is to create a laundry basket dresser out of plywood, plastic laundry baskets, and metal brackets. The entire project costs less than $50 and can make a huge difference in your laundry room. Get the full tutorial from Ana White. 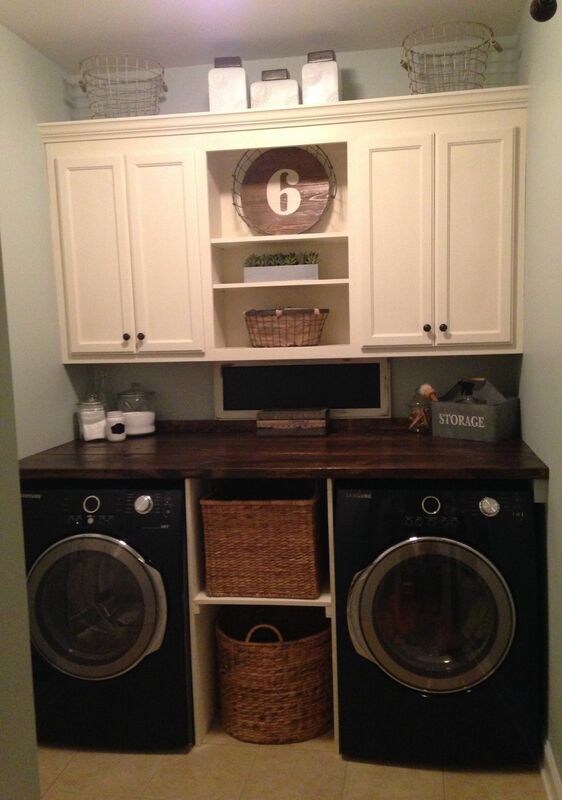 When you have a little more to spend, you can make your laundry room like something from a magazine! We got this image idea from Media Cache. For starters, the best way to keep your laundry room organized is to install cabinets above the washer and dryer. Closed doors let you hide detergent and dryer sheets out of sight. Leaving ample space above the cabinets gives you an extra shelf for decorative items or additional storage if you need it.In large laundry rooms, wrap-around cabinets, counters, and shelves provide all the storage you’ll ever need! We got this idea from Remove and Replace. In a small laundry room, you don’t have room for things like ironing boards and clothes drying racks. To prevent your chores from seeping into other parts of your home, try these DIY small laundry room organization tips. 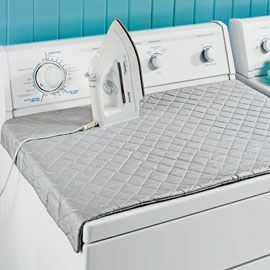 First, use a quilted ironing mat instead of a bulky ironing board. You can drape it over any flat surface to instantly create a safe, convenient place to iron blouses and dress pants. The washer or dryer serves as the perfect temporary ironing board, but you can also use a countertop or table. Plus, you can’t argue with the price! Another low-budget option for small laundry rooms is to build your own wall-mounted clothes drying rack. When not in use, it takes up zero floor space, but it instantly becomes functional when you need to hang your delicates. Get the full tutorial from Centsational Girl. Having two washers and dryers makes it easier to keep up with the high laundry demands of a large family. 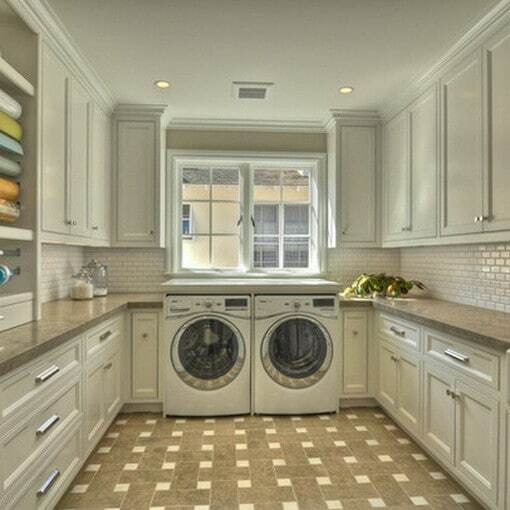 If your big laundry room can accommodate it, install a pair of washers and dryers. You’ll find it easier to keep the room organized when dirty clothes don’t linger.